Free shipping on November 26th! For as long as SparkFun has been around, everytime Thanksgiving nears, we get questions about participating in "Cyber Monday." If you're not familiar, "Cyber Monday" is online retailers answer to "Black Friday" - a day shortly following Thanksgiving for shopping deals. Orders that qualify (based on weight/value restrictions) will be eligible for either domestic Economy Light shipping or for international orders, USPS First Class Mail International. If your order doesn't qualify for either of those shipping methods, the next level up of shipping will be free. You'll be able to tell what shipping level your order will be eligible for when you check out. Sorry distributors - we love you guys, but you're not eligible. The free shipping will only be for orders placed from 12:00 a.m. Mountain Time on November 26, 2012 to 11:59:59 p.m. on November 26, 2012. If you have any questions, please feel free to leave them in the comments section below. We'll post another reminder closer to the date. Cheers! A Special "According to Pete"
Is there any way you guys can get any more awesome??? Do I have to state the obvious? Really do I? . . OK, you made me say it. . . Isn't that what Dave's for? I CAN'T WAIT FOR FREE DAY!!!!!!!!!! I know that's totally off topic and all, but free stuff (shipping) gets me excited---That's a lie--SparkFun gets me super excited!!! [cheapskate]Does that mean no handling fee for local pick-up, too? For some reason I read this comment and the line "I want my two dollars!" popped into my head from Better Off Dead. ...we hadn't really thought about it. If it's easy to do, I will tentatively say that seems reasonable. No promises. Would the handling fee really matter? You're probably wasting just as much (if not more) in fuel traveling there (if by car). We should offer a bicycle discount. I would willing bike the 4,000+ km to Boulder just to say that I took advantage of the bicycle discount. so Nate, any chance to grab some SF non voting stock in the near future? Hi guys, what a great news and a good initiative from you. However, I would have few questions : - What is the equivalent time zone for the "Mountain Time" ? - Can you give an estimation of weight and price limit for the international orders based on you experience ? - Just to make sure, does it still work if you fill up your cart previously and validate the order this day ? I hope you are stocking up, Christmas is gonna be earlier this year for a lot of people around here ! Will there be a Planet Express option? because I want to use them. I hereby demand Sparkfun to do the same for Free Day 2013. Or at least something reasonably similar. Last time I had to pay 115$ to retrieve my 100$ prize. That wasn't funny, almost made me wish I didn't win. Almost. Yesssss!! Now there's actually a reason to shop cyber monday. You know that 100% off is already free? Also because X% off of X% discount are the same, would mean you'd like to pay double? I think they can arrange that! If your order is light/cheap enough for USPS First Class Mail International shipping, then that shipping method will be free. Otherwise, the next level up that your order does qualify for will be free. 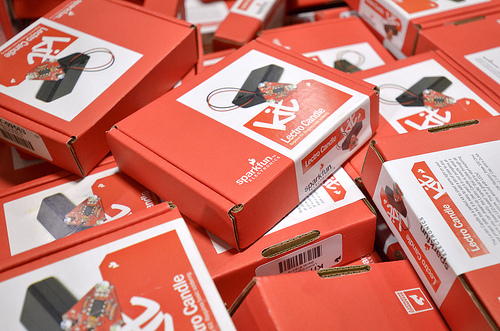 The weights/values are set by the shipping provider and not by SparkFun. Either way, on Monday the 26th you can fill your cart, go to checkout, and the method that's available for free shipping will be clearly marked. Now I have a reason to add the Heaterizer to my cart. Before its was only like $3.00 for shipping to PA for the small parts I need. Now its $9.00. Must find bigger stuff to order. It does. My old job entailed shipping similar equipment the world over, and we actually started building in Singapore because the shipping savings to China (our major market) was irresistible. Labor costs were the same, parts costs were the same, but shipping made it worthwhile. So does this mean the pick and place spare parts grab bag will come back into stock soon??? Spare Parts Bags will be stocked today! aaaand there gone....again...........only 8 in stock?? When will there be more? SXSW 2015 -- Help us get to Austin!